In applied mathematics, physical quantities are (predominately) represented by two distinct classes of objects. Some quantities, denoted scalars, are represented by real numbers. Others, denoted vectors, are represented by directed line elements in space: e.g., (see Fig. 1). 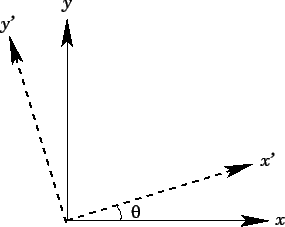 Note that line elements (and, therefore, vectors) are movable, and do not carry intrinsic position information. 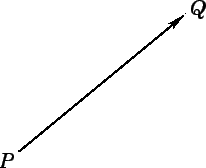 In fact, vectors just possess a magnitude and a direction, whereas scalars possess a magnitude but no direction. By convention, vector quantities are denoted by bold-faced characters (e.g., ) in typeset documents, and by underlined characters (e.g., ) in long-hand. Vectors can be added together, but the same units must be used, just like in scalar addition. Vector addition can be represented using a parallelogram: (see Fig. 2). Suppose that , , and . It is clear from Fig. 2 that vector addition is commutative: i.e., . It can also be shown that the associative law holds: i.e., . There are two approaches to vector analysis. The geometric approach is based on line elements in space. The coordinate approach assumes that space is defined by Cartesian coordinates, and uses these to characterize vectors. In physics, we generally adopt the second approach, because it is far more convenient. It is clear that vector algebra is distributive with respect to scalar multiplication: i.e., . In mathematical terminology, three vectors used in this manner form a basis of the vector space. 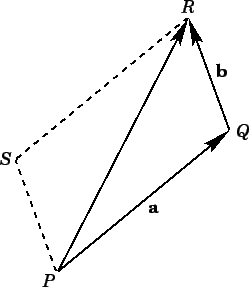 If the three vectors are mutually perpendicular then they are termed orthogonal basis vectors. However, any set of three non-coplanar vectors can be used as basis vectors. We do not need to change our notation for the displacement in the new basis. It is still denoted . The reason for this is that the magnitude and direction of are independent of the choice of basis vectors. The coordinates of do depend on the choice of basis vectors. However, they must depend in a very specific manner [i.e., Eqs. (7)-(9)] which preserves the magnitude and direction of . with similar transformation rules for rotation about the - and -axes. In the coordinate approach, Eqs. (10)-(12) constitute the definition of a vector. The three quantities ( , , ) are the components of a vector provided that they transform under rotation like Eqs. (10)-(12). Conversely, ( , , ) cannot be the components of a vector if they do not transform like Eqs. (10)-(12). Scalar quantities are invariant under transformation. Thus, the individual components of a vector ( , say) are real numbers, but they are not scalars. Displacement vectors, and all vectors derived from displacements, automatically satisfy Eqs. (10)-(12). There are, however, other physical quantities which have both magnitude and direction, but which are not obviously related to displacements. We need to check carefully to see whether these quantities are vectors.